I’ve been on a bit of a pizza-kick lately. And by a bit of a pizza kick, I mean that the only thing I’ve been craving for the past month has been pizza. I’m not even going to tell you how many times I’ve ordered a pie, or how many dreams I’ve had involving pizza (yes, I’m serious), or that I changed my cover photo on facebook to a picture of a beautiful, almost heavenly sky with rays of sunlight bursting out onto…a pizza slice. Okay, maybe I am going to tell you that. I don’t discriminate when it comes to pizza. I’ll eat deep dish, brick oven, NY style, and, yes, pan pizza. Who can honestly resist the allure of your local Pizza Hut from time to time? I’m not ashamed to say that sometimes I’ll pick the Hut over our local pizzerias. Sometimes you just crave that puffy, crisp-outside, fluffy-inside crust. And today, that’s exactly the kind of crust I’m going to share with you. 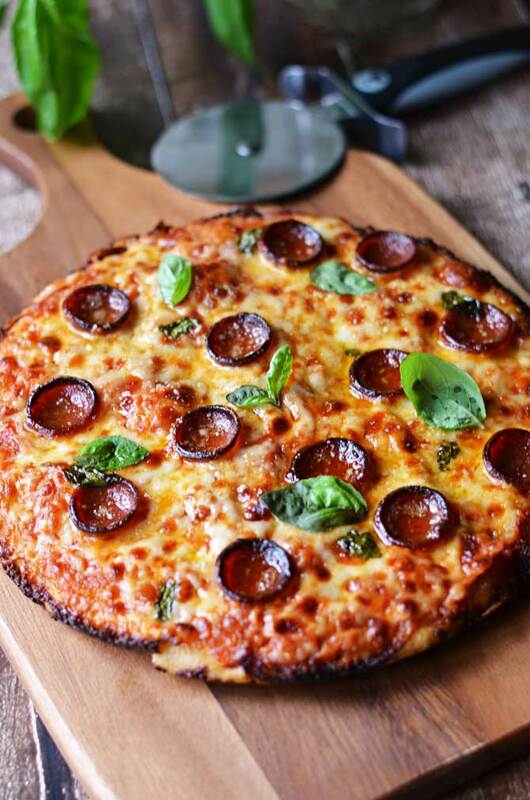 Now, I know that pizza dough seems a bit intimidating at times, but I guarantee you, you can make this crust. 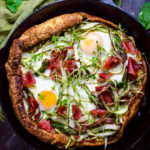 In fact, this crust recipe is from Kenji Lopez-Alt over at Serious Eats, and he calls it “Fool-Proof Pan Pizza.” Fool-Proof. You don’t have to trust me, but Kenji? He’s never wrong. 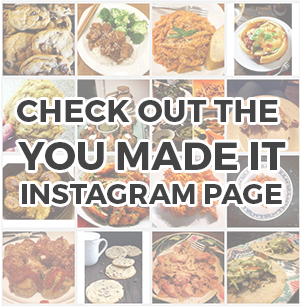 I knew this recipe would be a total hit when I saw it, and I regret taking so long to make it. 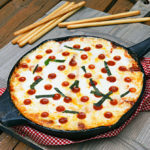 It seriously is the best pan pizza I’ve ever had, and it is so simple. Like, you-don’t-have-to-knead-it simple. Like, just-let-it-sit simple. You know how easy crock pot recipes are? We’re pretty much on the same level here. 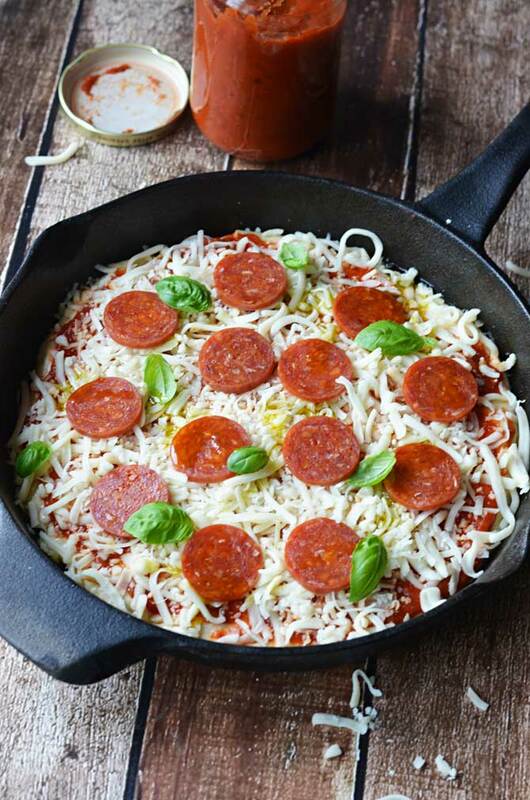 If you’ve got a cast iron pan on hand and a couple of minutes before bed (or in the morning before work), you can whip together a dough that will require hardly any effort when you get home and want dinner! I altered Kenji’s recipe ever so slightly to incorporate the yeast I had on hand, and to adjust for 1 serving rather than 2, but that was pretty much it. I’ve said it before and I’ll say it again, when you find a perfect recipe, you try not to mess with it too much. 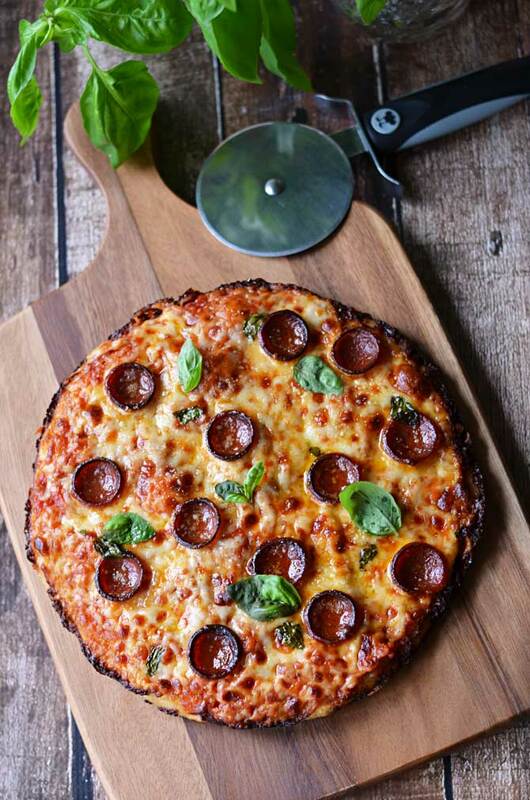 Top your No-Knead Pan Pizza with whatever your heart desires. 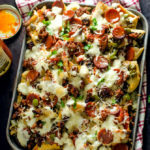 Whether you’d like to get funky and throw on your favorite crazy ingredients, or keep it simple with some marinara and cheese, there is no wrong answer here. I chose pepperoni and basil as a topping for my first go, but you can bet I’m going to switch it up in the months to come. Or weeks. Or days. In fact, maybe I’ll make another pan pizza right now. Combine yeast and 1/2 cup + 2 tablespoons warm water. Let sit for 15 minutes for the yeast to proof. 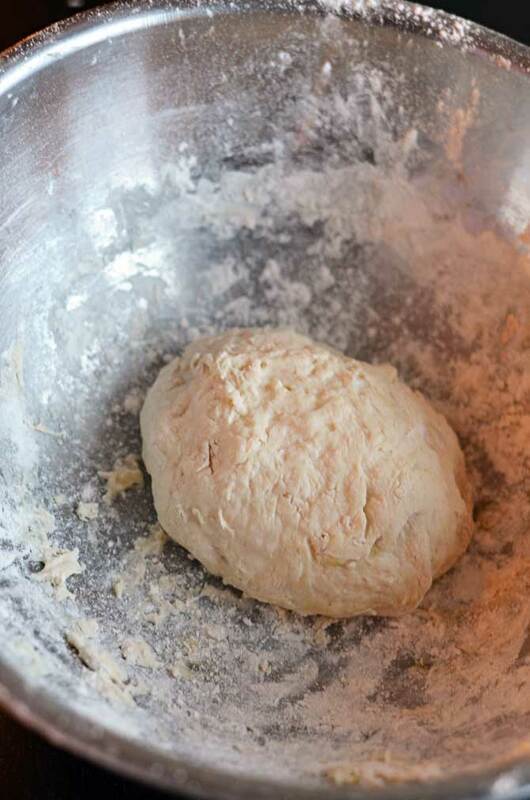 Combine the flour, salt, yeast and water mixture, and oil in a large bowl. Mix with your hands or a wooden spoon until no dry flour remains. (I prefer to start off with a wooden spoon and then get in there with my hands to really make sure it’s well-combined.) The bowl you use should be at least 2 times bigger than your dough ball, so that there is enough room for it to rise properly. Cover the bowl tightly with plastic wrap and leave in a warm, draft-free area for at least 8 hours and up to 24. I typically leave my dough on the countertop to rise, but if it’s cold out, keep in mind that it might take longer for your dough to get where you want it to be. When the dough is ready, it should be doubled in size. On a floured, flat surface, turn the dough out of the bowl. 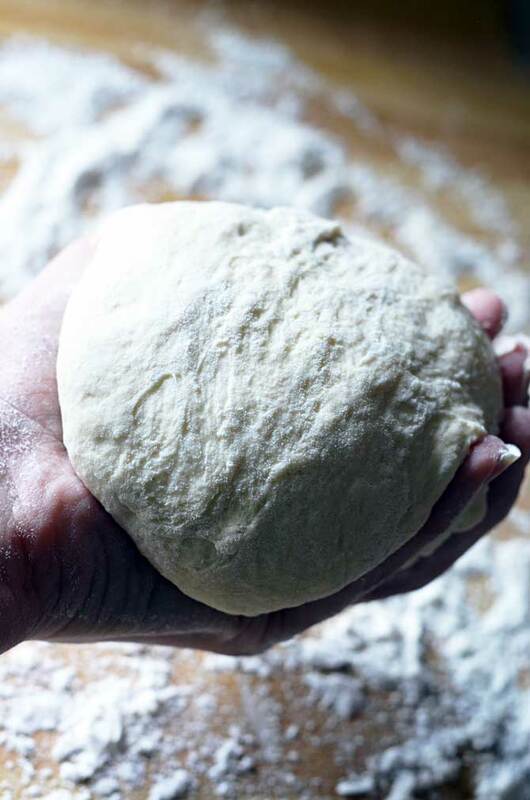 Flour your hands and form the dough into a ball by tucking each of the ends underneath, one at a time. 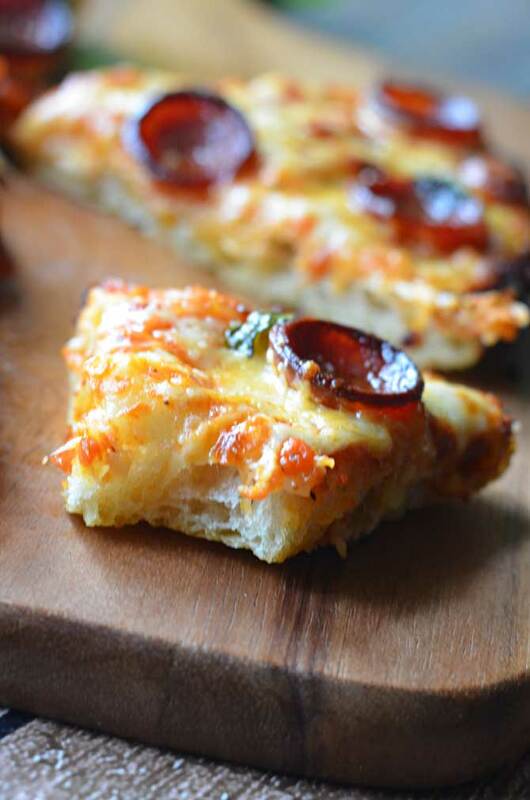 Drizzle a tablespoon of oil into the oven-safe pan and put the dough in. Turn and move the dough around so that it is evenly coated with the oil. Lightly press the dough out with your hand to flatten it slightly, and move the dough around the pan so that the oil is well-distributed. Cover with plastic wrap and let sit for 2 hours. After the first hour, preheat the oven to 550 degrees F.
After 2 hours, the dough should have creeped to the edges of the pan. 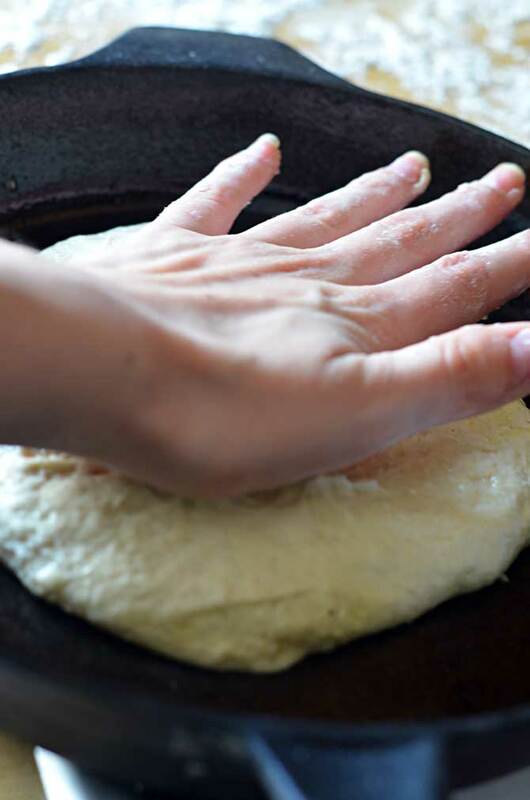 Using your fingertips, pop any large dough bubbles, and press the dough around to completely fill the pan. Then, lift the edges of the dough to let any air trapped underneath escape. 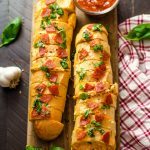 Top your dough with sauce, cheese, a drizzle of olive oil, and toppings as desired. 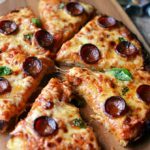 Put the pizza in the oven and cook for 15-20 minutes, or until cheese is golden and bubbly, and the crust is browned and crisp. 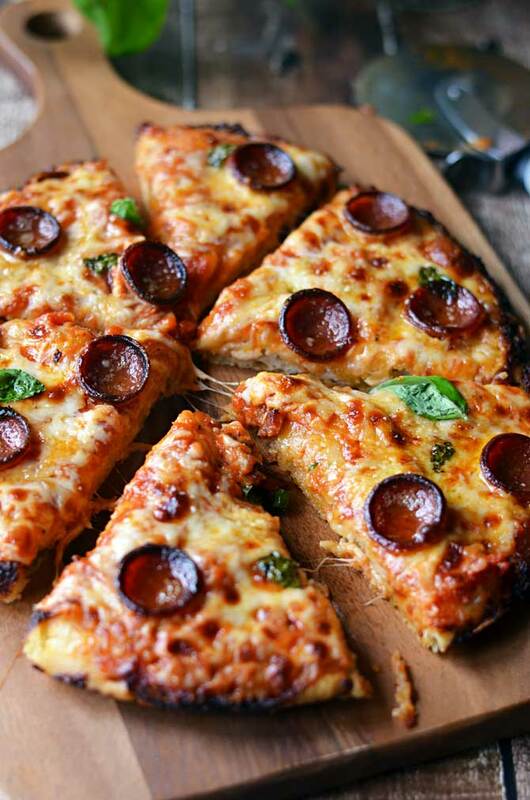 Remove the pizza from a pan and slice on a cutting board. Serve immediately. This looks ridiculously delicious! I am so glad I bookmarked your website. I made your Crock Pot General Tso’s Chicken for dinner and it exceeded my expectations. You have got a great site! I can understand how way you feel for craving a Pizza, co’z I’ve been there also on that feeling. Thanks to you i just follow your recipe and it turns out so delicious and made my craving fully satisfied. It’s great that i read your blog site. 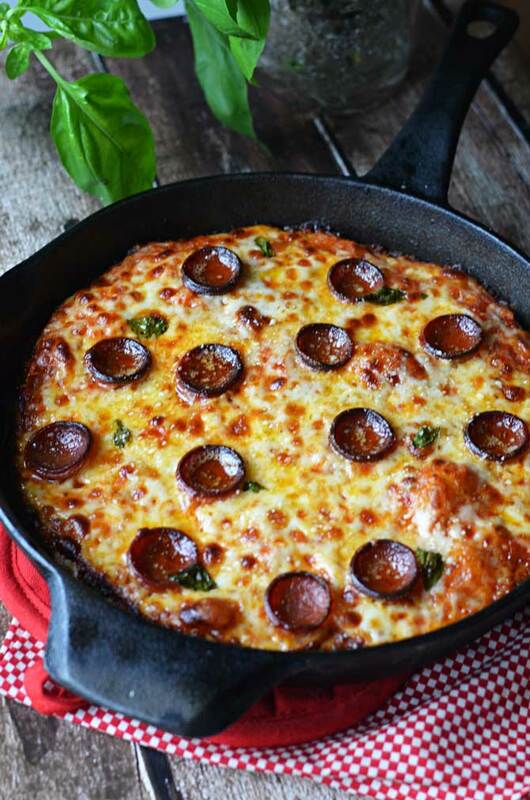 This looks amazing but I don’t have a cast iron pan that isn’t a grill pan. What else could I use to bake it in? I’m trying it today in my Pampered Chef stoneware large bar pan, it’s 14.75 x 10.5 inches and I doubled the recipe to fit. We’ll see how it goes! Just the perfect pizza. I only wish my oven would get hotter than the 250C I’m stuck with! Have you tried this with wheat flour?